You will not be disappointed with this Slim Line Shower Filter. With it's sleek slim line contours, wonderful chrome design and superior quality filter cartridges produced exclusively for PureShowers.co.uk. With it's sleek slim line contours, wonderful chrome design and superior quality filter cartridges produced exclusively for PureShowers.co.uk, you will never regret installing this shower filter in your bathroom. The slim line and stylish shower filter is the perfect shower filter for those of us who want to keep our existing shower heads but still want the benefit of healthier, cleaner, chemical free and softer showers. It simply attaches to the base of your steel shower hose or attaches between your existing shower head and the water pipe, thus filtering all the impurities and nasties from our shower water before it reaches us. Using custom built Shower Filter cartridges specifically designed for PureShowers.co.uk, the technology within this Shower Filter is a high quality mixture of KDF-55 (US patented and certified by the NSF) and GAC. 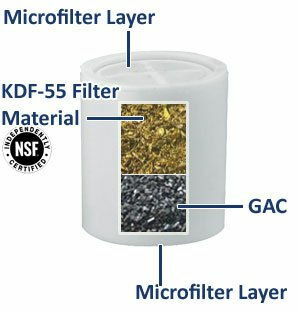 The majority of entry level Shower Filters on the market that use these filter mediums, will typically use an inferior 75% GAC and 25% KDF-55 mix to reduce cost. Resulting in an inferior Filter and shorter life. Quality is always at the forefront of our minds and therefore we have developed this high quality Shower Filter cartridge for our entry level Shower Filter. Yet we have maintained the same price for our customers, we believe quality should not cost more - it should just be inherent in all the things we do. The Shower Filter comes with the cartridge installed, each consists of a 4 stage filtration system. The final stage of the Shower Filter is yet another micro filter which removes any carbon based materials, ensuring fresh clean water. Shower Head Attached to Pipe (see image above). Is your water outlet pipe very close to the wall? Then we recommend the 8 Stage Shower Filter, because it can be fitted to an angle. Backflushing the shower filter maintains the shower cartridges life span and also ensures that any contaminants that are caught in the shower filter can be flushed out. To backflush the shower filter, simply install the shower filter upside down and run water through it for 5 mins, then install it the correct way up again. Great product and great service, will be buying again! The shower water feels better, and there is less mess (scum/scale) left on the shower walls etc. I live and work in Qatar middle east and i purchased the shower filter for my wife who was always complaining about the harshness of the water here(it is all desalinated)and the effect it was having on her hair. The filter I purchased was so simple to install and acording to her she is seeing an improvement in her hair. Quick delivery. Very easy to fit. Overall, very pleased with the product. Really perfect and effective, since installing I have no more skin tightness, redness or itching. Poor instructions for installment. But seems to be cutting down on the limescale in the shower. I bought two slimline units, one for our own use and the other for my daughter and her family. We have been really pleased with the improved water quality. Thanks very much! Very prompt service, also it is working taking out the chlorine in our water. We have very heavy chlorinated water here. The shower filter was delivered quickly and it fitted perfectly into our existing shower. We were very happy with the product, only criticism was assembling the unit without it leaking. But a quick e-mail to pure showers son put that right. Results excellent! Thank you for the fast and efficient service. Good product so far gives a correct result with less itchy skin and scalp. the installation was difficult because can leak at the junction of two half-shells when pressurized, fixed by adding Teflon tape. This is a good product that works well. Ours only lasted 6 months though, and our water isnt what I would call very bad. The replacemnet filters that I have just ordered are not cheao either at £25.00. The shower filter fitted really easily and we could feel the difference in water quality immediately. The water is much softer and odourless. An added bonus is that we don`t have any build up of scum and limescale on the shower unit. My glass is gleaming, what a fantastic time saver! Thank you. The shower filter works really well... one critic would be that the fixtures prevent it from fitting below our shower bracket, instead it has to go on top which makes the shower head too heavy to stay up... so we have to hold the shower head when we want to use the filter. but apart from that it is brilliant! Great products both my wife and myself very pleased with results. I have just bought our first filter replacement although I don`t think we require it just yet. Once again great product good results, thanks. We found Pure Showers to be very helpful and responsive when we purchased a filter and then found we need additional parts because of our shower installation. We`ve now been using the filter for about a month and my wife is very happy, although I am yet to be convinced. All in all a very good service and a product that seems to do what it says on the tin for a reasonable price. The system works very well. Great service, would definetely use this company again.Thank you. Service I cannot fault. I have noticed my skin doesn't itch anymore but it hasn't cleared the eczma. At least i'm not itching anymore! The filter in itself is great. What I found less clear were the instructions and which way it should be installed. The person I spoke to on te first call was very professional, he knew what he was talking about. And the filter changed my life. I did recommend it to friends and family. Thank you. Very good works well. We have all noticed the difference since fittings the filter. The unit was very easy to fit and of a high quality. Very good and fast delivery. So far so good. Everything is working great. The filter works great. Our old one was similar but from Berkey. This one was cheaper and got here very quickly. I like the fact that the filters are replaceable--instead of throwing the whole thing away after each use. So far so good, the water doesn't smell of chlorine and less itchy skin. My daughter loves taking her showers & baths and I'm happy that she's in cleaner water. Super fast delivery and a product that does what it was intended for. Happy customer. I buy your filters for my three year daughter's bath time - she has eczema. Pureshower filters really help manage her skin condition - we certainly notice the difference if we don't use one. Great service, great products, what more could you ask for? We have been away and have not been a been able to give the filter a proper test, but it is now easier to clean the shower and shower cabinet. An excellent item and fitting it to the shower was straightforward. Have been using the filter for several weeks now and there is a noticeable improvement in skin and hair condition with less itching and dryness. Fast delivery of item and helpful response to any questions. Recommend!! At the start, I had a few teething problems with the installation of my shower filter because the instructions were not comprehensive enough and one of the seals inside the filter was deformed. Therefore there was a lot of water coming out. After reporting this problem, the Duschfiltershop replied to me immediately. They told me to dismantle the filter and put the seal back in place again correctly. After doing so there was - almost - no leak left. It would certainly be helpful for other users to include this tip in the instructions. Very happy with the product and will be buying replacement filters, however the instructions failed to state what way the filter needed to be fitted. I had to make a phone call to find out. I'm sure many who but it fit it upside down. We had a query on the fitting of the product, and appreciated the prompt and helpful email response. After-sales service like that makes all the difference. Am very satisfied with all my purchases of late. Thank you again for your top-notch professionalism. The shower filter is very good. The water is much softer. I realised it almost immediately when I washed my hair and skin. Comes highly recommended. Great condition and sent promptly. After 2-3 weeks use we're feeling the benefits. Less itchy scalps and softer hair. Easy to fit, although slight problem with leak from middle of filter which turned out to be due to the large rubber washer being poorly seated (now resolved). Good product & efficient fast delivery. However, slightly better offers would be good for repeated custom. Also, the instructions included with the filter don't specify which way round it should be installed so not sure if this is pertinent to effective function or not. I am not in the habit of leaving any comments after purchasing a product because most of the time I am not satisfied and we usually get ripped off on account of deceiving advertising but this time I must say this product is exceptional. I have immediately felt the difference and so has my hubsand. In terms of water quality, I used to suffer greatly of dandruff due to the limescale contained in our local later and as early as the second shower, I have noticed a real difference. I even feel my condition has been healed now. I must say I had tried other products in the past but none had wielded such results, if at all. That is why I wanted to thank you for being so honest and nice with your clientele. I would like to recommend this product to everyone out there because of its very good quality and affordable price. The water actually feels softer. Even when washing one's hair, the difference is quite noticeable. I guess I shall be able to tell more later on . I was not fully satisfied with the seals on the shower filter and had to go to a shop to buy new ones. Filter arrived very quickly and was not difficult to install. Results? softer water and skin and a much cleaner shower floor? no iron red staining which required scrubbing to remove. Thank you. The water that comes out of our paragon luxury shower head filter is crystal-clear and we can no longer smell the stench that used to come out of our pipes. Our hair and skin particularly like this product. The Slimline filter works well, and I feel an improvement after showering. However I purchased a shower head for m daughter, which we cannot fit due to the existing installation (fixed). Is it possible I could return this unit? Product arrived promptly, am satisfied, easy to install. After fitting the filter my wife and I found that it stopped the itching we both had after showering. we are both very pleased with the filter and would recommend it to our friends. I did not receive my original item in the post but another one was delivered promptly. Thanks. I am absolutely delighted with this product. I have suffered with eczema for years now and tried lots of different creams etc. I just googled a question....what are the causes of eczema and your sight appeared like a miracle from nowhere. After just a few weeks of using the filter my red itchy legs are free from the big red blotches that were so irritataing. I just can't believe it, after all that time I am at last seeing my skin appear as normal, even my husband itchy scalp has been miraculously cured. I have just ordered two filters to continue the good work. THANK YOU Pure Showers and THANK YOU Google. The shower Filter was delivered promptly and has been installed now for approximately 2 months. There is a noticable difference in water quality. The entire family are reporting softer hair and skin. No build up of limesale either and the shower enclosure is very easy to keep clean. Highly recommended!! It would have been helpful to know that I would need tape to cover one of the joints so that it didn't leak. Funnily enough i did not see the 2 washers in the pack so I initially used our older ones. However once this was sorted the shower filter works fine. No leaks. It seems to be working as there is no discoloration on our plastic shower curtain which usually happens after a few weeks. It would be useful to add the dimensions of the products to your web site. Some may already have that, but the filter I bought did not and that would have been helpful at the time. delivery was very fast and there has been a noticeable difference in my hair since using the filter. My order was processed very quickly and came with clear instructions. I had no problem attaching the filter to the shower head. The filter is working fine. I have noticed it had reduced the itchiness of scalp and body enormously. Does what I wanted and delivery quick. I have noticed an improvement in my skin and hair. I suffer from eczema and it has slowly improved my eczema over the last 2 months. I will be ordering a replacement filter in the coming months. Arrived as stated great. Does the job fine, has purified the water great no more green hair. Fitted on shower. Delivery of the 'slim-line' shower filter was very fast, it arrived within 2 days and I was able to fit it without any problems; very pleased indeed. My hyper dry scalp condition (also psoriasis) has also improved tremendously since I installed this filter. Amazing ! Product arrived promptly, is exactly what I need/ordered. I would recommend Pureshowers to others. The filters have transformed my families shower experiences completely, with no more dry itchy skin - all for a reasonable price! 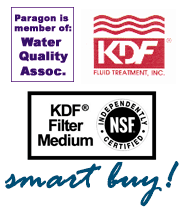 Great after purchase advise, friendly service and a great product (slim line shower filter). Highly recommended. Now that I have my shower filter, my hair and skin has never been more soft. I have been waiting for this for a long time now. It`s truly amazing! Excellent product, cheaper than rival companies and delivered within promised timescales. Thank you. In South West London we have some of the hardest water in Britain. Before getting this filter, I had to dismantle and clean the shower head every 3 days to prevent it getting blocked up by lime scale. We have now had the filter for 1 month and the head remains clear and limescale free. I have had to open the filter once to empty out the scale, because we do have ridiculously hard water, but other than that, it is great to finally not have to worry about limescale build up. I give the water filter a 5 star ,does exactly as described on the website and with the chemicals taken out its really is easy to get a lather from the soap ,my psoriasis has improved a bit but not a great amount which is the reason i purchased one but on the whole an excellent purchase for £30. The reason for purchasing the filter was because I suffer from a skin condition and as we live quite near to a water treatment plant, we could always smell chlorine in our water. Since fitting the filter to our shower, there is no chlorine smell at all. We are considering fitting a filter to the incoming source to our home but wonder if that would be too expensive an option as all the water from source (the ketchen tap being the point of entry to the house) would be used for the dishwasher and washing machine etc. The filter was difficult to fit at first - it leaked a lot and my husband made 3 phonecalls to yourselves trying to work it out. In the end he fitted some plumbers tape to the screwing joint before screwing the two halves together, and nothing leaks at all. Am very impressed so far, other than the leaking problem at first, I would give it a rating of 4. If he hadn't had to use tape, would have given it a 5. I would like to say thanks for your product, I ordered it less than a week ago, I reside in Greece and I received it VERY fast. Most importantly I am satisfied with it, as I have bought MANY shower filters (KDF) from various suppliers at some EXTREME prices (especially in Greece) that were presented as Swedish filters (however printed on their box read made in Korea) Not that I have any issue with Korea /China etc but false advertisement, along with VERY high cost plus the filters longevity being UNDER 3 months is too much. I only had a small problem installing it because my shower faucet is TOO close to the wall so it could not be installed at that point, so I installed it at the beginning of the shower head pipe, thank god its not too heavy! :) You also sell the replacement filters, as opposed to other filters I have ordered from all over the world and/or bought here in Greece, I always had to buy the entire filter again, which meant more $ and re-installing. I'm sticking with you from now on! I hope yours will last as it says, I used to live in Canada and KNOW the feel of CLEAN water on my skin and especially hair, as soon as I got your filter I tried it out and YES finally everything seems perfect. Thanks again I will order it again, Good price, WORKS and fast delivery!!! As a suffer of eczema I find the filter helps as the water where I live is very hard and drying. The new filter I got from you is much nicer looking than the previous one I had as it looks like part of the shower. You can tell these filters work as there is no limescale on the shower head at all and normally there is a lot Five stars all round. I am very pleased with it so far. So many thanks! I don't have to scrub the shower doors nearly as much and my hair feels much softer. I am interested to know how long the filters last. I will give more feedback in a couple of months. I would like to give you some feedback regarding the Slimline Shower Filter we purchased recently. I would rate the Slimeline Shower Filter 5 (FIVE) STAR due to the fact that the water now coming through our shower is filtered and feels like 'real water' should. (I am 60 years old and remember how water 'felt' in the past?) I beleive that there are too many chemicals and additives put in our water these days - in the main they are not required - in fact - they can have a detrimental affect on and in our bodies. Both my partner and I noticed immeadiately how much softer the felt, not harsh and abrasive as it was before we fitted the filter. We do not itch or feel 'still dirty'. The is no smell or fumes either when heated. The fliter is also a breeze to fit. As for the cost of the filters - very reasonable. Please remain competitive is all we ask. Also, service and delivery is second to none - and it was a pleasant change to actually 'talk' to a human being when ordering something. The slim line shower filter works well, but is not that slim line. It required me to move out my Triton power shower slightly from the wall in order to allow it to fit without bending anything. 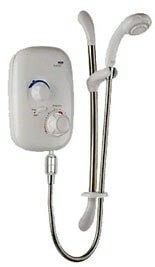 We changed from an in head shower filter to this when we changed to the retro style over head drenching shower. No complaints with the way it works, i.e. 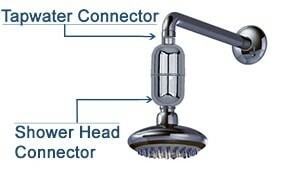 doesn’t reduce pressure and the water coming out of the shower head is clean and free from chlorine. * Reply From PS * : Thank you for your review - we supply a free angle pipe with our shower filters just in case of this situation. All you need to do is let us know that you need an angle pipe at time of purchase and we'll pack it with your order, this is written in the product description. We've just contacted you to see if you would like one.